Whilst half of has of them show Boston Red Sox supporters, the other half show either a man or a woman wearing a MAGA hat, sporting a confederate flag tattoo and holding either a bible or a Chick-fil-A cup. The clear professional layout of the poster, which is printed in colour and fits perfectly on the trash can shows the intent (and the financing) of the maker. 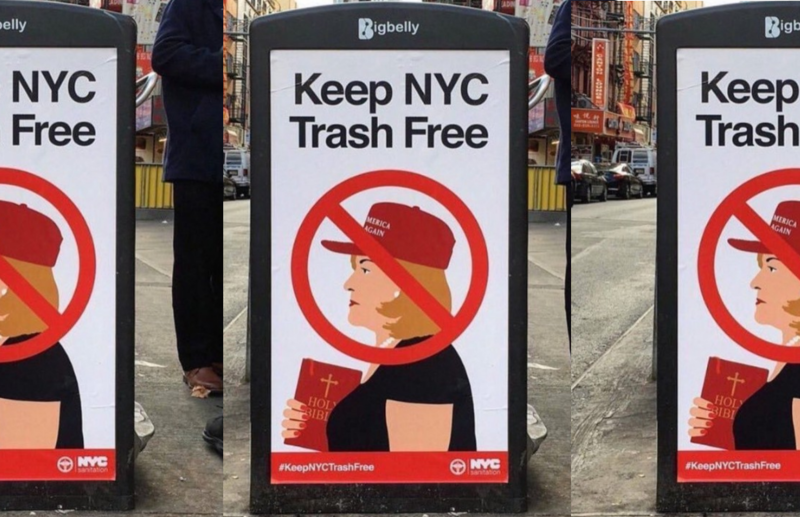 Although many will be removed, you can be sure that in certain New York areas is simply serves as a reminder for all of how divided the nation is at the moment. In fact, according to an Associated Press-NORC Center for Public Affairs Research poll released Thursday, the majority of Americans says that the upcoming Midterm elections, as well as the recent Kavanaugh Supreme Court hearings, show one thing above all: the US is sharply split among political lines at this moment. An overwhelming majority of 80% of Americans is said to be unhappy with the current state of US politics. The voters’ views on the White House administration and President Trump in particular are split among party lines. On the Republican side, where immigration and the state of the economy rank as the top issues, 83 percent approve of the job he’s doing, while on the Democratic side, where diversity, inclusion and foreign affairs are seen as more important, 92 percent don’t. Just when you thought the left would attempt to disprove how stupid they are…………. I have been to New York once when we came into the harbor on an ocean liner in the mid-60’s from Europe. Now all I see is this representation that I don’t like you because you’re Christian. That is how the national socialist party worked. This is the last desperate measures of the Democratic party before the midterms, they're really scared about an utter electoral rout. Matthew 10:22 - And ye shall be hated of all [men] for my name's sake: but he that endureth to the end shall be saved. ***Matthew 5:10 King James Version (KJV). 10 Blessed are they which are persecuted for righteousness' sake: for theirs is the kingdom of heaven.